Right before Segerstrom Theater’s curtain rose for Disney’s famed stage classic The Lion King, the suspense was palpable. Why wouldn’t it be? In 1994 the Disney film of the same name shattered records as the highest-grossing animated feature of all time. It debuted as a Broadway musical in 1997 and in 1998 was nominated for and won a myriad of Tony Awards –including Best Scenic Design and Best Costume Design. With over a decade of historic nostalgia preceding it, the current touring company is doubly pressed to turn out a great performance for lovers of both the movie and the original Broadway show. How does this production measure up? The answer is pretty well. Simba is a happy, confident yet mischievous lion prince who finds himself getting into a few scrapes. When his jealous uncle forces the young cub to run away from his home, Simba finds a new life and enjoys seemingly carefree days until he grows up and must decide whether to confront his past or continue his lackadaisical lifestyle. This is one of the most colorful musicals of all time –literally. All of the costumes are absolutely beautiful and play a huge part in the transformative process. 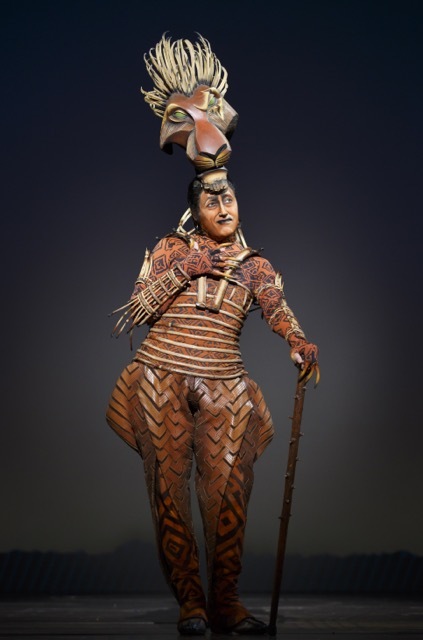 The cast is required not only to dress as animals but also in many cases use puppetry to truly bring this stunning image of the African Serengeti to life. The clearly characterized movement of every performer onstage fascinates not only the adults in the audience but also the children. (Just imagine what would happen if kids were forced suffer through a person lazily manipulating a puppet or wearing a spotted leopard suit halfheartedly while stalking across the stage). It is also important to note the costumes truly are part of the entertainment. It is nye on impossible to get bored simply because there is so much to look at. Birds, giraffes and even elephants make an appearance here. Their presence brings an energy and realism to the stage that could not have been achieved otherwise. As a film The Lion King is incredibly colorful and well-animated. The costumes of the stage version are fantastic and manage to measure up to the movie in this way. However, to say the play and movie are equal in every way would be false. Sitting in the theater it becomes blatantly obvious with every passing moment they are not equal. DO NOT GO if you are hoping for a carbon copy of the film! Many of the most dramatic scenes in the movie do not have the same power when viewed onstage. Stampedes, battles, and scenes taking place on cliffs have neither the tension nor the artistic beauty of the the animated version. What the stage DOES have is a better score. I should say an improved score –no, a longer score. Though certainly memorable, the film soundtrack for The Lion King is fairly short. When creating the staged adaptation Disney did not take away, but added on, putting in beautiful and insightful songs such as “He Lives In You” and “Shadowland.” These two songs alone provide a clearer look into the mindsets of Simba and his friend Nala –thus enriching their characters and making the story even more interesting (I bet you didn’t think this was possible, but it is). This whole show provides a clearer understanding of each character’s motivations and even clears up some questions I had when watching the film as a child. Speaking of characters, the cast is stocked with strong singers. The acting is fair but different from what may be expected. Patrick J. Brown is not really intimidating as Scar so much as he is amusing. With his whining tantrums and sullen demeanor, he sort of resembles Prince John from Disney’s Robin Hood (1973). Tre’ Jones played Young Simba the night I was in attendance. Like the other performers he possesses a beautiful singing voice, and with his small slim frame, he can be considered the physical ideal for the young lion prince. I do think the director should give him a bit more rehearsal as far as the acting goes. A lot of his dialogue comes out either excessively rushed or with frequent pauses. This cheats the audience of what should be some poignant and emotionally charged scenes. People may wish for me to gloss over this, but the fact is the person playing Young Simba carries the entire first act of the show. The second act is mounted firmly on the foundation he builds. He is just as much of, if not more of, a leading man as Aaron Nelson (Adult Simba). They should really work on getting him up a level or two. Having said all that, children love to watch other children, and the ones I spoke to after the show could not get enough of Young Simba. Surprise standout performance of the night goes to Nick Cordileone who plays Timon. Frankly, Timon has never been my favorite character, but Cordileone steals the show through being quirky but not overly obnoxious. He is genuinely funny. In this way he makes the bossy meerkat more endearing. In The Lion King the audience interaction flows throughout the entire show. There is a solid foundation of audience interaction, a staggering amount only done occasionally at other shows and never at all in the movies. Actors walk up and down the aisles –providing up close and personal moments that will not soon be forgotten. In fact the most touching piece of audience interaction I’ve ever seen took place the night I was there. I was seated near the aisles close to a young boy who was visually impaired. At the beginning of the second act ensemble performers stood in the aisles and sang to us, while waving and smiling at children in the audience. When the performer nearest to me noticed the boy, she stepped closer and gently brushed her hand over his hair by way of greeting. 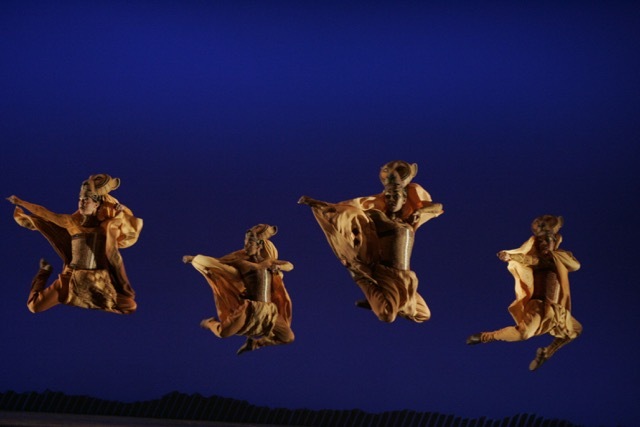 The Lion King has fantastic staging, costumes, music, and of course a plot that earned Disney millions. This is definitely one of the finest stories being told in Orange County right now.